The Myakka Canopy Walkway provides easy access to observe life in the treetops of an oak/palm hammock. As an outdoor laboratory for research and education, it is a place for discovery and provides an opportunity for visitors to see canopy inhabitants up close. Completed in 2000, this structure is the first public treetop trail in North America. The walkway is suspended 25 feet above the ground and extends 100 feet through the hammock canopy. The taller tower soars 74 feet in the air to present a spectacular view of treetops, wetlands, and the prairie/hammock interface. You can look down on eagles, hawks, vultures, and the tops of Live Oak and Sabal Palm trees. Metamasius callizona, the exotic weevil, pictured above. Picture from the University of Florida Department of Entomology and Nematology. The walkway proved its practical value with an alarming discovery within months of its opening. An exotic weevil from Central America (accidentally released in Ft. Lauderdale around 1990) had arrived in Southwest Florida. 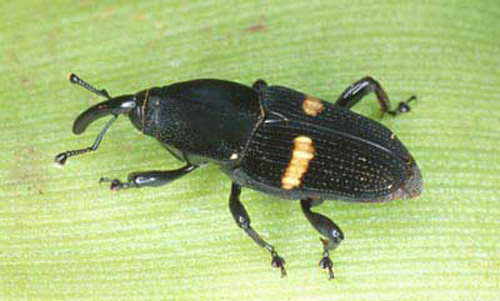 Wherever the weevil invades, it decimates airplants. Local students are working with TREE Foundation researchers to monitor the weevils and airplants. The Myakka Walkway was the inspiration of canopy scientist Dr. Margaret D. Lowman, Executive Director of TREE Foundation. It is the result of a unique partnership among the Florida Park Service, Friends of Myakka River, TREE Foundation, and other local sponsors. A few hundred yards into the woods, the canopy walkway emerges! The small tower (pictured here) is the best place to start your adventure. A neat trail leads visitors to the Canopy Walkway. The complete William Boylston Nature Trail is a wonderful 0.8-mile walk. However, visitors can take the "short way," a few hundred yards that leads right to the Canopy Walkway. Tucked into the woods, the Canopy Walkway has two towers connected by a 100-foot suspension bridge. This picture was taken near the smaller tower, looking up at the bridge and taller tower. The Canopy Walkway is as educational as it is recreational. Signs provide guides and information about the wildlife visible from the structure. The 100-foot suspension walkway immerses visitors within the tree canopy. Be ready for steps! The tall tower is 112 steps to reach the top. Tantalizing panoramas of the treetops can be seen on the journey up the Canopy Walkway towers. Atop the tall, 74-foot tower is a breathtaking view of Myakka's various ecosystems. See dense hammocks unfold into vibrant prairies and idyllic marshes cluster by streams and the river. The Canopy Walkway is a wonderful experience for adults and children alike. There is no additional cost (beyond regular park entrance fees). The experience requires walking over 100 stairs. Please be prepared for physical activity before attempting. Dogs are welcome on the Boylston Nature Trail, but please do not bring pets onto the Walkway structure. The Canopy Walkway is painstakingly maintained by the Friends of Myakka River, without whom the structure would not exist. To support the Canopy Walkway and other similar projects, please visit the Friends of Myakka River website and donate, become a member, and/or learn how to advocate for protecting natural resources.